Walton, Jo. 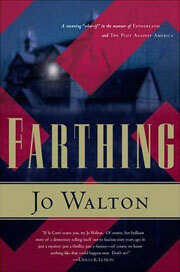 Farthing . Tor 2006. What if: Rudolf Hess's mysterious flight led to peace between Britain and Nazi Germany. (There are suggestions in the second volume that the divergence occurred a few years earlier.). Series note: Trilogy including Farthing , Ha'penny and Half a Crown . Publication note: The series is also known as Still Life with Fascists. Summary: A murder mystery set in 1949 at an English country estate and involving prominent members of the government. Suspicion immediately falls on the only Jew present. Series note: First book in Small Change. Published: Tor/Forge 2006 (0765314215BUY), 2007 (076535280XBUY), 2013 (0765323133BUY). Translation: Spanish by Carmen Albaladejo as El circulo de farthing , La Factoría de Ideas 2008 (8498003601). Translation: Hungarian by Gábor Novák as Farthing , Delta Vision 2008. Awards: Nominee: 2006 Nebula for best novel. Finalist: 2006 Sidewise Award for best long-form alternate history. Walton, Jo. Ha'Penny . Tor 2007. Summary: Weeks after the events of Farthing , the detective involved is called in to solve the mysterious bombing death of a stage actress. Meanwhile, another actress is unwittingly dragged into an assassination plot. Series note: Second book in Small Change. Published: Tor 2007 (0765318539BUY), 2008 (0765358085BUY), 2013 (0765323141BUY). Walton, Jo. 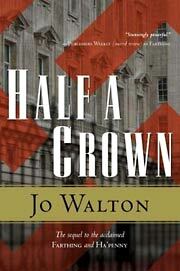 Half a Crown . Tor 2008. Summary: In 1960, the head of Britain's Watch worries about an impending "peace conference" in London and visit by the Duke of Windsor. 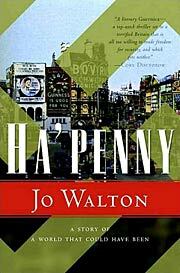 His debutante ward is caught up in affairs when a riot breaks out during a political rally a week before she is to be introduced to the queen. Between them lies the end to British fascism. Series note: Third book in Small Change. Published: Tor 2008 (0765316218BUY), 2013 (076532315XBUY). Awards: Finalist: 2008 Sidewise Award for best long-form alternate history.